I don't think you'd enjoy an MMO where you can get banned for being in a zone higher level than you or for dancing outside of "designated dance zones". @Chris: Designated Dance Zones? That sounds like some sort of Taliban-inspired happiness quarantine method. @Azuriel: I hope I only inspire you within games; I'd be terrified to actually meet someone like that. Ya the murder at the wedding was definatly a "turning point" kinda like Anakin getting sent to the temple after becoming Vader, one of those...... after this i cant go back. I almost felt bad until my wife critiized me for sniping her with a bow, told me "If i was a man id get up close and kill her "like a man" haha and Odin knows i couldnt balk from that challenge. The Ork bard kill was incredibly satisfing, i payed him for a song, and after his horrible voice made everyone run away in panic i slit his throat, it was glorious. 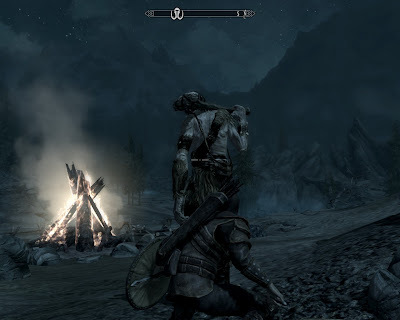 I used a bow at first, but then I realized I could instead drop a gargoyle on her. It reminded me of a quest from Oblivion where I could also kill someone with a falling piece of decoration. I figured that would make for a better mess and a worse funeral.